Those eligible include artists from or living in Ireland. With a first prize of €15,000 and a €5,000 commission to boot, the relative absence of better-known names is surprising. Is portraiture innately conservative, and so less appealing to the cutting edge? There is certainly a well-meaning moralism about some of these works (back stories are available in the exhibition catalogue) and the resulting lack of ambiguity can have a flattening effect. Perhaps because she has only herself to consider, Vera Ryklova’s photographic self-portrait Untitled #5001 operates at a remove from such niceties. The artist exposes herself, literally in the open gesture of her body, and more affectingly in how she combines sexual assertiveness and vulnerability in the same self-image. Looking closely at the exhibition’s only other photograph, Kim Haughton’s picture of the actor Gabriel Byrne (the sole celebrity here), a couple began discussing the work over my shoulder. “It’s a photograph?” – “No, it’s a painting” – “Really, wow, look at the book shelf, imagine having to paint all of those titles”. Verisimilitude creates the wow factor, even when the wow in question is not quite what they thinks it is. Capturing the famous actor in reflective mood, Gabriel Byrne is a good photograph. We have the voyeuristic pleasure of seeing inside his New York apartment, while access to his inner world is hinted at (at the time he was playing James Tyrone in Eugene O’Neill’s Long Day’s Journey into Night) but denied. Returning to the giant heads. Jennifer is an oil painting on canvas by Stephen Johnston. A bravura act of painstaking detail, you sense the artist has worried away at his task, careful lest his idol-like subject smite him for any hair out of place. Part of an ongoing community project, the ‘ordinary’ subject of the painting is rendered extraordinary by the artists monumental treatment. Similarly oversized and finely detailed, the male sitter in Catherine Creaney’s This Too Will Pass is more pensive. The large head is expertly rendered, but it’s a sort of high-fidelity gone hyper, the surfeit of detail leaving little room for the imagination. 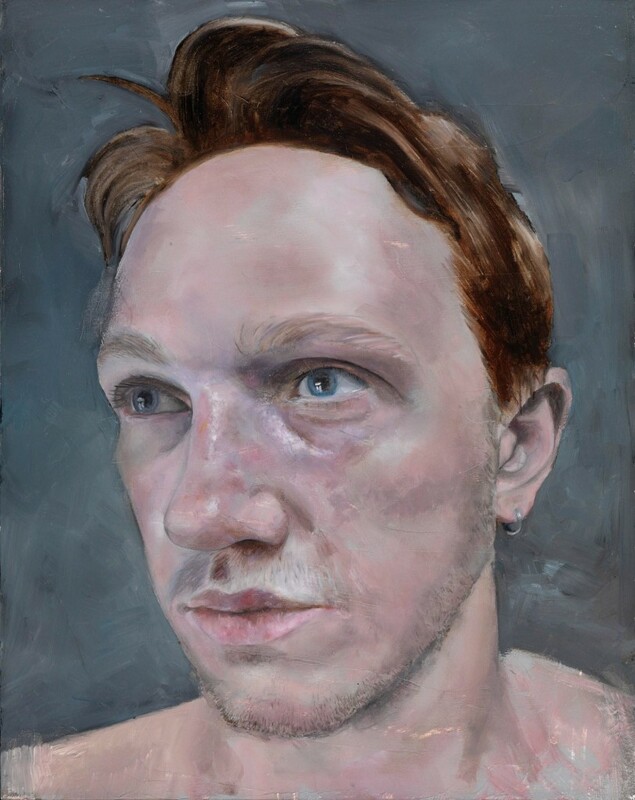 The artist mentions the “almost brutal honesty” of Lucien Freud as an influence, many of whose portraits, coincidentally, are on show across town at IMMA. While both of these paintings are closely observed, they lack Freud’s domineering ruthlessness; it is the subject here who is king. I have a soft spot for Harold, an egg tempera painting on true gesso panel by Fergus A. Ryan. While every thread of ‘Harold’s’ tweed and corduroy ensemble appears individually executed, we never lose sight of it as a painting, a handmade response to the subject’s living presence. Harold himself conveys a self-assured jouissance, his calm gaze contemplating you, contemplating him. And speaking of jouissance, making some notes in the gallery café, I wrote that Seán, a small oil painting by Gerry Davis, had the most ‘juice of life’. Swift seeming and faintly bruised, the vividly painted head has an ideal scale, the proportions of the work coinciding with the human subject. For its modesty and liveliness, I was glad to hear it named the eventual winner.